Before we start with Random Wednesday...Happy Halloween and Trick or Treat Day! 1. Speaking of Halloween, I must admit that I am not a huge candy/sweets fan. I typically prefer salty (think chips and salsa). But, I can tear through an entire bag(s) of Twizzlers in less than time than it takes me to shower. So, I am keeping my fingers crossed that Logan and Landry get a sack full tonight and I will be able to stash them in my secret drawer. And I wouldn't be upset if they got a few Twix and Kit Kats as well. Anyone else swipe your kids' candy and hide it for yourself? 2. The color mustard. I have never been a fan, until the stores started putting out fall clothes this year. I always associated it with well, with mustard, as in the condiment. I picked up this cardigan a few months back and have worn it more than I ever expected. I call it my ol' trusty now. And then I moved onto mustard colored denim that you can see here. So, a color that used to be a "no-no" for me has now become a "yes-yes". Do you have a color that you have grown to love? 3. I started the psychological, suspense thriller, Gone Girl, this week after reading some positive reviews on a few blogs. I like it so far, but not super intrigued just yet. I am ready to hit the juicy, I don't want to put this book down part. Have any of you read it yet? 4. I know I already mentioned it last week, but I have to say it one more time....I am obsessed with Taylor Swift's new album, Red. I can't get the songs out of my head. I must stop the repeat madness. What albums/songs do you have on repeat? Don't forget to listen to Micheal Jackson's Thriller at least ONE time today. Maybe I will put it on repeat. I'm the same way. I don't do yellow or mustard, but lately find myself stocking up on it like no other. I think I have this same sweater, but I'm pretty sure mine doesn't fit that long. Target has a million and one cardis out right now, so who knows. What I do know is that I'm on the hunt for the perfect one... keep an eye out for me! Happy (early) Halloween to you too!! When I stilled lived with my parents, I stole my sister's treats and hid them. haha!! My sister's convinced me mustard is a great color, but the husband doesn't like yellow!! I loved Gone Girl. I felt the same way the beginning was meh--ok...but then it got gooood!! really good!! Have fun trick-or-treating with your girls!! LOVE this outfit! It's way cute! Welcome to the mustard lovers club. haha! I was just thinking that I need to watch Thriller too! Such a classic. Yellow and green in the spring/summer...pumpkin/burnt orange in the fall. I didn't like them, but like you, have found a few pieces that I found to be so versatile, especially in cardigan/sweater form. Happy Halloween from Abu Dhabi! Girl that color looks great on you - you definitely need more mustard in your closet! And love love love that necklace! I haven't read that book, but when you finish definitely let me know how it is! I am not a huge fan of Twizzlers but I love all the chocolate goodies. We had Trunk or Treat at church last night and pretty much gobbled up tons of Charlie's candy when he went to sleep. Terrible, right? Loving this outfit, Shanna!! Glad you came around with liking the color because it looks great on you!! I am ALL OVER MUSTARD this year too for the first time ever! Your skirt is awesome, your necklace is divine, and your whole look is perfection! Well done! Ohhhhhhhh Gone Girl blew my MIND! I won't say another word, BUT I can't wait to hear your thoughts upon finishing! I have a mustard cardigan that I have worn once or twice, but need to break it out again. And I felt the same way about the book, I kept waiting for the "good part." I hope I can get it back soon fromt the library (there is a waiting list) so I can continue and hopefully get there! I love the print of your skirt....it is so perfect with the mustard cardi! I love this outfit! I'm becoming a big fan of mustard, and that skirt. 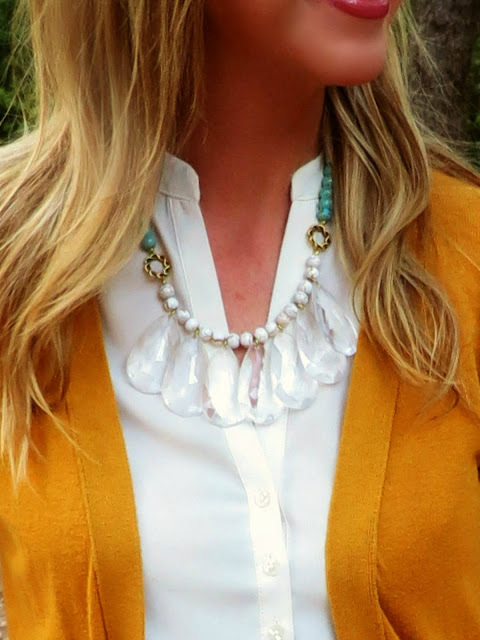 Isn't the Sweet Clover necklace great? I have one as well and it's so comfortable around my neck. 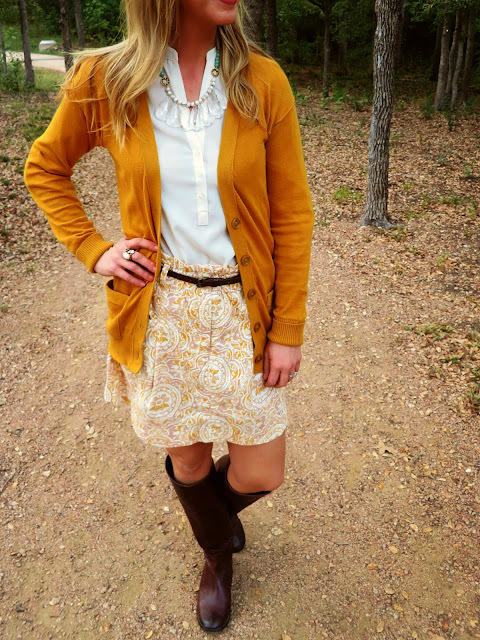 Love mustard and love your skirt! I just finished Gone Girl last week and I loved it! I also had a hard time getting it going, but once it kicks in, you will be hooked! Especially when you reach part 2!! I read Gone Girl. I loved it... until the ending. Then I was pissed. Girl.. how cute are you? Love the mustard! Happy Halloween! And yay for swiping candy! I have read Gone Girl. It's intense. And trust me you won't be able to put it down once you get a little further into it. 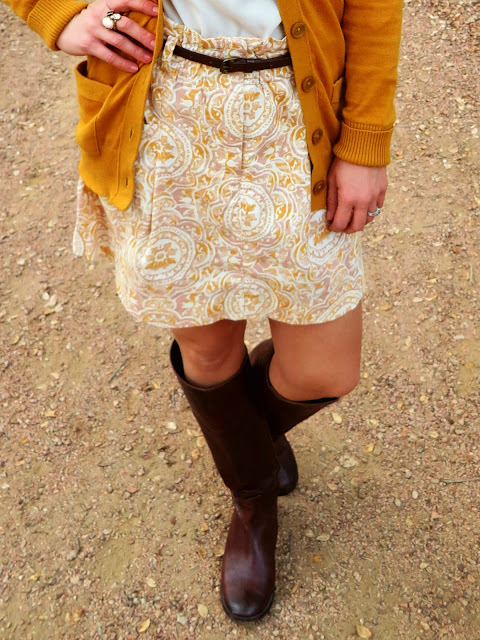 Love that mustard cardigan! Such a cute fall outfit! i really need to listen to Taylor's new album... haven't heard ANYTHING off of it - i know i need to get on that. you look AMAZING, shanna! love this look SO MUCH! i'm jealous you're not a sweets fan - i have such a hard time saying no to candy!! LOVE the color mustard! Love that outfit!! Super cute! CUTE outfit! LOVE the mustard....Halloween candy (the chocolate kind) is my WEAKNESS - I hope my kids don't get much chocolate! So I love this outfit on you alot and you know how I feel about mustard I can't wear it cause I look dead but those boots I almost at first glacé thought the we're Hunters and I was booking a ticket to rob your house. But these are still faboo! Gorgeous today! I love ya! I'm loving the mustard color, but I don't have much of it. I especially love the skirt. Your outfits are out of this world. Also, Gone Girl. LOVED IT! I just finished it about 2 months ago, I liked it(for the most part)but, I will say that I didn't like the ending. as always, lovely :) my hubs gets annoyed if I ask him to take a WIW pic. haha. now I tell him "hey, my blogs makes money...this is my job" ha! by the way, I'm loving the color mustard too! I want a mustard purse...BAD! Shanna, you always look so CUTE! You are rockin' that necklace -- EEK!!! :) I also LOVE the Taylor Swift album. I find myself obsessed with every album she comes out with, she is so clever with her words. This latest album in particular has touched me the most. And hail to the Twizzlers! My fav!! Happy Halloween! Kit Kats and Twix are def. a few of my faves. Ever had the white choc. kit kat? Amazing. Nom nom. TaySwift's album has me obsessed, as well. Treacherous and The Last Time are my favs. I love Snow Patrol. When I first heard it...first thing I did was look up to see if the guy was the lead singer of SP. He has such a beautiful and distinct voice...love it!! I am on the same page with you on the mustard. At first i was like ehh but now I need some! I love that cardigan. I think I'm going to have to pick that up! I am almost done with Gone Girl. It does get REALLY GOOD! I am really LOVING this outfit! It is perfect for this time of year. You are so talented at coming up with adorable outfits, seriously. LOVE. Twix and Kit Kats are my favorites!!! I really need to check out the Lauren Conrad collection at Kohls! I've been loving all the stuff I see! Happy Halloween! I HATE mustard, but I sure do love the color :) Looks great on you too. And "I knew you were trouble" BEST SONG EVER!!! Look at you cute girl!! ur outfit is so pumpkin delicious!!! I love this cute, mustard outfit! I never used to like orange, but that's a color that's really grown on me! I've heard such good things about Taylor Swift's Red--I'll have to check it out! Adorable, as always! I'm hoping we don't get any trick or treaters so I can keep the candy for myself. Spoken like a true fat kid! Have fun with your little girlies tonight! I really enjoyed Gone Girl. Wait until part 2 - then it will be hard to put the book down! I love mustard!! It took me a long time to get into Gone Girl but once I was in I couldn't put it down. I love this mustard cardigan! It's so cute! OH my gosh you are rocking the mustard- looks so so good on you! I love your random Wednesday posts! Cute skirt! Mustard is one of my favorite colors. I especially love pairing it with navy. This whole outfit is so cute! Man, those teardrop necklaces are so in-almost everyone has them in their wiww posts today! Fabulous outfit as usual girl. Happy Halloween!! Hope your girls have tons of fun trick or treating. you are gorgeous in mustard lady, so happy that you are embracing it! You look so cute! Mustard is your color, girl! It's definitely one of my favorites. Hope you score some Twizzler! I just bought the new album today! I can't wait to listen to it! Gone Girl is so good! Read her other two books as well, all really fantastic reads! I felt the exact same way about mustard for the longest time! But just this year I have really grown to appreciate it! It looks so good on you, girl! Mustard is your color pretty lady! You look gorg as usual:) I'm also obsessed with Taylor Swift's new album, I have it on repeat like 24/7!! It's just too good! Hope you had a good Halloween! Second, my book club was thinking about Gone Girl for our next read...you'll have to share what you think of it when you are done!